I went to the butchers, yesterday, to buy some lamb for Sunday roast. I also wanted something hearty to last me for a couple of days and they had some pie veal, ready prepared. Veal’s very good, but I wanted some strong flavours to go with it – then I spotted a chopped mixture they were doing called Poacher’s Stir fry! I don’t know exactly what was in it, Steve the butcher said it contained off cuts of rabbit, venison, bacon, ham, liver etc., with some bay leaves, rosemary, pepper and olive oil – it sounded perfect, so I bought a pound of each. Make the pastry as per my recipe here (the quantity in the recipe is correct for this pie). Once made, flour and wrap the pastry in cling film and put it in the fridge for at least an hour before using. Personally I think that home made pastry is so much nicer than the shop bought stuff, that I’d use it every time. In a medium to large cast iron casserole, cook the onion in some extra virgin olive oil. When the onion starts to go translucent add the chopped meat, chilli and ground herbs, keep stirring until the meat has coloured all over. Follow the meat with the bacon, garlic, celery and carrots. Once all the vegetables have been coated in oil, squeeze in the tomato purée, plus the wine and vinegar. The bay leaves can go in too and bring the casserole up boiling, put the lid on and place in a pre heated oven at 100º C for 2 hours. Taste the pie filling after about an hour and add extra purée, seasoning, wine or vinegar to taste. It should taste savoury, spicy from the chilli, slightly sweet from the tomato and have a hint of sharpness from the vinegar. Now is also the time to sprinkle on 2 heaped dessert spoons of plain flour. 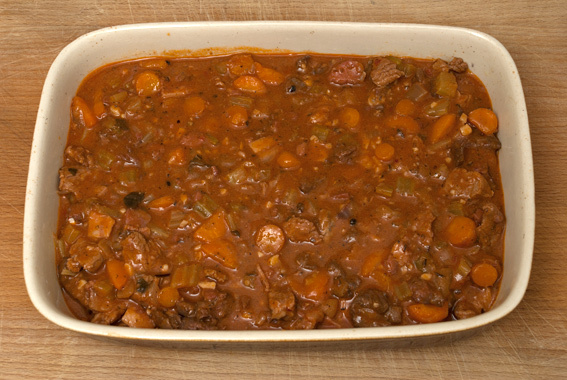 Stir this in thoroughly – don’t worry if it’s a bit lumpy it will dissolve in the oven. 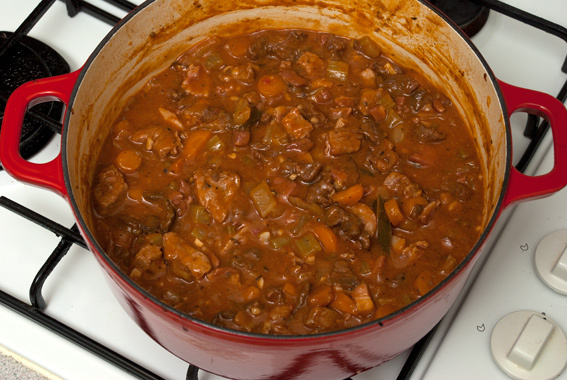 After 2 hours test the sauce again – add more seasoning if necessary. Once satisfied, set the dish aside to cool. When the pie filling is fairly cool, transfer it to a pie dish. 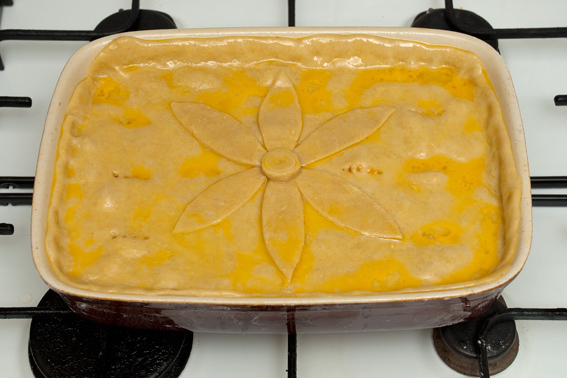 Roll out the now chilled pastry, cover the pie and crimp the pastry round the edges. Do make sure you prick the pastry with a fork to allow steam to escape. 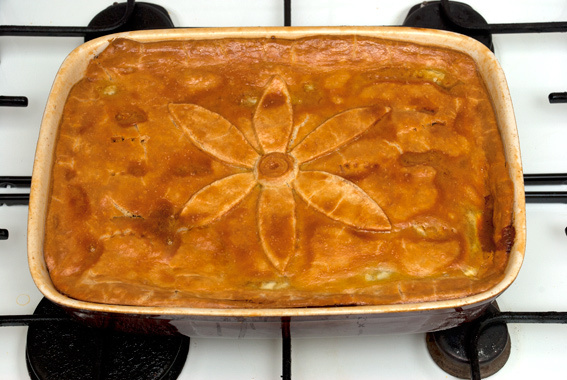 Decorate the pie with a motif and wash with a beaten egg. Bake the pie in a hot oven for between 30 and 45 minutes, or until golden brown. Allow to cool for at least 10 minutes before serving. Serve with seasonal vegetables, such as broad beans, broccoli, peas, runner beans, etc. This entry was posted in Food, Game, Meat, Recipes, Shopping and tagged butcher, egg, flour, mirepoix, pastry, pie, poacher, recipe, savoury, veal. Bookmark the permalink. This looks amazing. We eat a lot of rabbit here, usually just on the grill, but once the weather cools down, am going to give this a go! I am (was) a South Londoner, but clicked on your link to Theobalds butcher – I know it and agree, it´s a great butchers! That’s not a pie…. it has no bottom … how can I pick that up at my summer picnic . 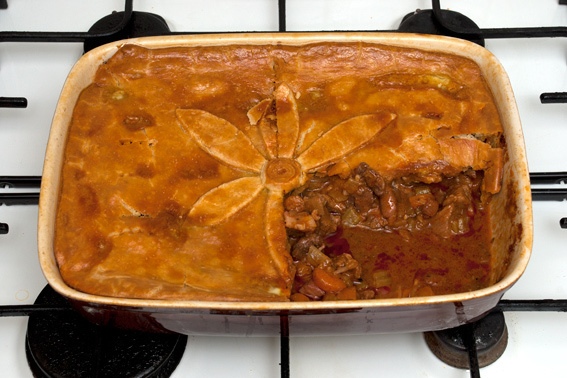 It is a pie top ….. are you on a diet and cutting back on the pastry … ?